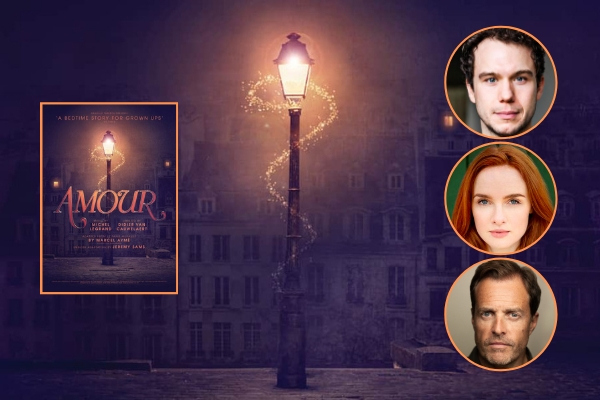 AMOUR, a musical fantasy about daring to dream and the power of self-belief, runs at the Charing Cross Theatre from 2 May to 20 July 2019, with a press night on 8 May. Casting is now announced. Gary Tushaw (Tateh in Ragtime, Charing Cross Theatre; Joseph Taylor Jr in Allegro, Southwark Playhouse) will play Dusoleil and Anna O’Byrne (Laura Fairlie in The Woman In White, Charing Cross Theatre; Christine Daaé, The Phantom Of The Opera and Love Never Dies, West End) will play Isabelle. Alasdair Harvey (Sunday In The Park With George, Mamma Mia! We Will Rock You, Sunset Boulevard, all West End) will play the Prosecutor, Isabelle’s controlling husband. They are joined in the cast by Elissa Churchill (Elephant Steps, Arcola); Claire Machin (Memphis, The Pyjama Game, West End; Flowers For Mrs Harris, Chichester; Titanic, Charing Cross Theatre & UK tour); Keith Ramsay (The Cereal Cafe, The Other Palace; and a cabaret artist, Black Cat Cabaret at Crazy Coqs, Wilton’s Music Hall and Spiegeltent at London Wonderground); Steven Serlin (The Wild Party, The Other Palace; Oklahoma!, Grange Park Opera; Charlie And The Chocolate Factory, West End); Alistair So (The King & I, West End; Jimmy Winter in Nice Work If You Can Get It, Upstairs At The Gatehouse); Daniel Stockton (Nicely Nicely Johnson in Guys & Dolls, Kilworth House); with understudies Laura Barnard and Jack Reitman. The UK premiere of AMOUR production is directed by Hannah Chissick and designed by Adrian Gee, with choreography by Matt Cole, lighting by Rob Halliday, sound by Andrew Johnson and musical direction by Jordan Li-Smith. It's produced by Danielle Tarento, whose many other hit musicals include Titanic, Death Takes a Holiday and Ragtime at Charing Cross Theatre, Allegro, Grand Hotel, Grey Gardens, Dogfight, Taboo, Victor/Victoria, Mack & Mabel and Parade. AMOUR runs from 2 May to 20 July 2019 at Charing Cross Theatre, The Arches, Villiers Street, London WC2N 6NL, with performances Mondays to Saturdays at 7.30pm, matinees Wednesdays at 2.30pm and Saturdays at 3pm. Tickets are priced £22.50-£32.50. CLICK HERE TO PURCHASE!